Nutri Grain printable coupon is back = $1 per box! There is a printable coupon that will make Nutri Grain bars just $1 per box! Print the $1/2 Nutri Grain Bars coupon. Use zip code 12345 to find the coupon. Sign up to print a new Jamba Juice coupon! Log In to your PINK Nation account (or sign up for free) and print out this coupon for a FREE PINK water bottle with any PINK purchase. Coupon valid 5/1-5/7. Must present photo ID. While supplies last. Thanks Extreme Savings with Diva Desirae! Pampers Wipes just $1.22 with printable coupon! Get Pampers wipes at Walmart for just $1.22 with Pampers wipes printable coupon! Vistaprint has a HUGE selection of completely FREE items! Choose from personalized Business Cards, Rubber Stamps, Sticky Notes, T-Shirts, Tote Bags, Photo Flip Books, and MORE! For a limited time Vistaprint is allowing you to get 6 FREE items all on 1 order (usually just 1 Free Item is allowed per order) + reduced shipping cost! * On the partners offers page, just choose SKIP or No Thanks on all the offers by leaving the boxes unchecked. High Value Revlon Eyeshadow coupons! Use zip code 77477 to find it. WOOHOO!! 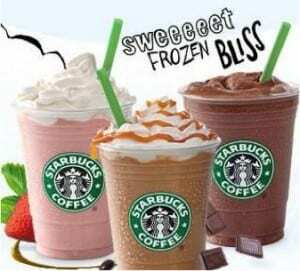 Participating Starbucks are bringing back the Starbucks Happy Hour! Get Half-Priced Frappuccinos from May 4th – May 13th from 3pm – 5pm. Shopping Trip – All this for $3!!! Went to Albertsons and got some GREAT deals with coupons! (7) Pepsi Next 2Liters $1 each – (7) $0.55/1 Pepsi Next 2 Liter coupons from 4/29 Pepsi insert – (7) Double the Value Albertsons coupons = ALL FREE!!! (2) Barilla Pasta $0.99 each – (2) $1/1 Barilla Pasta printable coupons = BOTH FREE!!! Paid $8.60 and Got the $5 Coupon to use towards my next purchase for purchasing 5 Cereals = $3.60 for everything! Get a Free Stability Ball when you sign up at FitStudio (part of Sears). 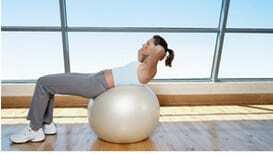 Use promo code BALL to get the coupon for a FREE Stability Ball. They will email you the coupon. FREE Barilla Pasta with printable coupon! Print the $1/1 Barilla Whole Grain pasta coupon from their Facebook page. This goes pasta frequently goes on Sale at most stores for $1 =FREE!